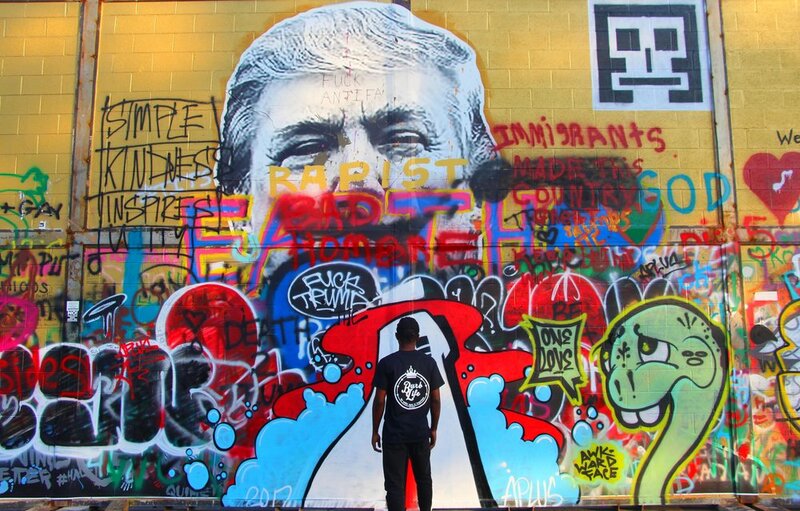 On Atlanta's west side there stands a 40'x16' tribute to free expression--The Border Wall. The wall, a public art instillation designed by artist Joseph Guay, was constructed exclusively by undocumented Mexican labor workers. The installation aims to raise social awareness on issues surrounding immigration in the United States. Upon construction, the wall was decorated by only two graphics: an image of Donald Trump on one side and the official flag of Mexico on the other side. The public was invited to view the installation and add their own expressions to the wall. The wall debuted in July 2017 and will remain on view in Atlanta through December 2017. Learn more about the installation here. If you study the wall, you see outrage, contempt, pleas for unity, platitudes of inspiration, defiance, and much more. Sitting on an empty lot, the graffitied wall echoes the voices of many. And these voices are not isolated. You may read them on your timeline, or hear them on your radio, or television, or your favorite podcast. In all of this, the wall remains neutral. A platform for expression. A messenger. There will be a time when history will recount our actions and recall our words and analyze our convictions. A time when our grandchildren will ask where we stood when the lines were drawn in the sand. And this wall is a reflection of that. Beyond this wall there lies an America divided, but justice, equality, and freedom remain absolute and unequivocal ideals. And those absolutes should be the bedrock of our society. Where are those that will stand for the disadvantaged? Where are those that will lend voice to the muted and dismissed? Where are those that will defend black lives, protect brown babies, champion for marginalized women, and shield all those that are persecuted by our society and an unjust system. It is time to read the writing on the wall, choose a side, and give voice to that which you believe. 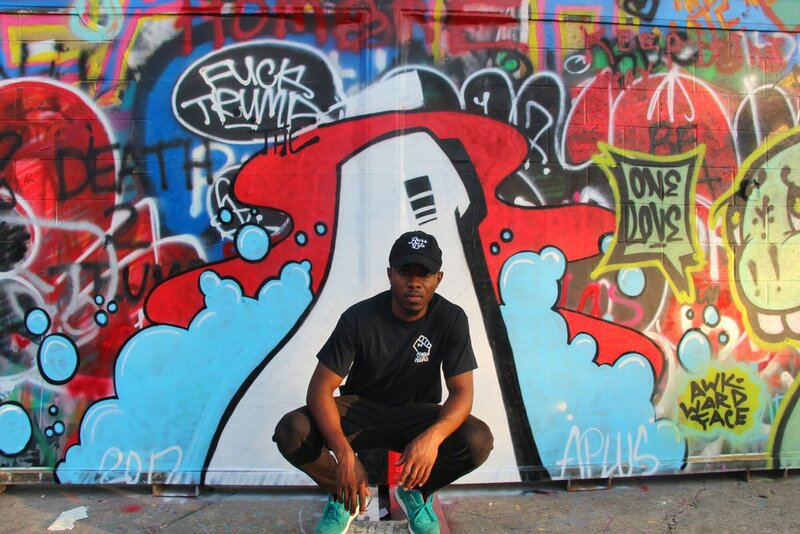 View the photoset of BurbLife-sponsored artist AJ Bank$y at The Border Wall in our new Power to the People t-shirt below. This shirt is for those that dare to fight against the complacency of average. For the brave souls that aspire to change the world--we are with you. coming of age isn't a peaceful transition. There is no proverbial baton that is effortlessly passed from adolescence to adulthood. No, it is a violent awakening that is met with anxiety, angst, confusion, and disappointment. Our idyllic reality eaten away like soft enamel by the trepidations of life. And it is here we learn to swim as we are no longer buoyed by the falsehoods of our naiveté. Swim or perish. It's 7:30 p.m. on an unusually mundane Friday night and Shamir Dominique, better known by his rap moniker Sha the Flash, is experiencing his own awakening. 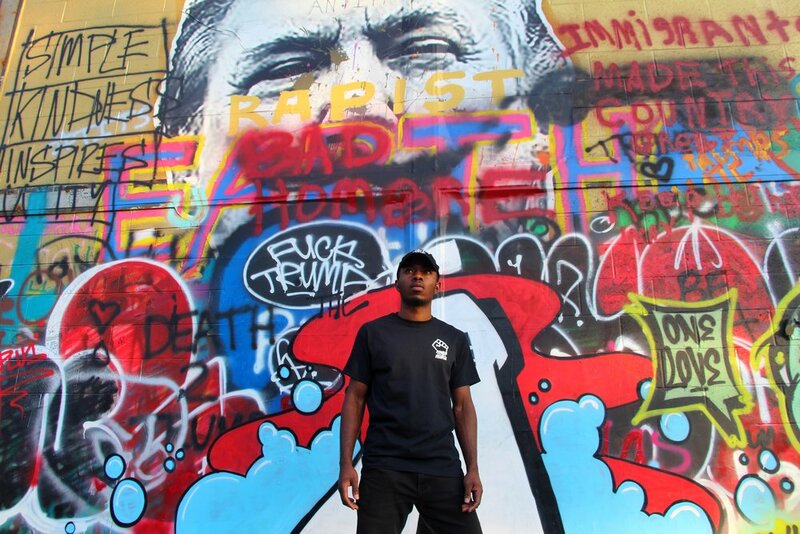 The 22-year-old artist is primed to release his debut project, The Valley, this spring and has immersed himself in the creative process to bring it to fruition. Over the knock of 808s and symphonic high hats, he recounts the process of meticulously crafting The Valley which, based on his recklessly poignant accounts, feels like a modern-day adaptation of Apostle Paul's conversion in Damascus if chronicled by Kate Chopin and produced by Noah Shebib. Which isn't far off since biblical allusions are woven throughout the framework of this project. The Valley is a reference to the valley of the shadow of death [which is described in the Bible in Psalms 23]. The morning I started working on the project I was in a rut. I was locked up in my room acting like a simp so I did what most niggas do. I cracked a bottle of hen, and rolled me a stick or 3. While I was going through beats I was reading my bible, which contrary to popular belief I personally enjoy chiefin while chilling and reading scripture. Naturally astute, Sha juggles his ambitions of rap stardom with those of med school, but his struggles outside of music are what brought him to his valley of reckoning. Heartache over a tough breakup with his dream girl coupled with financial aid complications that threatened his academic future eroded the young rapper, spiritually. He describes feeling paralyzed as life bombarded him with complications. I was stuck. I wasn't creating musically. My college diploma was being held because of Sallie Mae, and I had to come to terms with the fact that I was going to lose my dream relationship and be alone. I just felt like I was dragging everybody I loved down with me. For Sha, there was no golden chariot. No shortcut. And for a period of time, there remained nothing except the sinking feeling of self-pity and regret. He recalls incessantly praying for wisdom as he tried to piece together his next steps. The prayers taught him patience and humility and time brought perspective as he quietly discovered his own strength and self-love. And then in the mercilessly bleak valley, God answered. It was there I stumbled through Ezekiel 37. Here in the book of Ezekiel my dawg (pardon me) was stuck in this Valley that God brought him to. The valley was covered in death and dry bones and God asked him "Can these bones live?" When Ezekiel answered "only you know," God told him to command the bones to to rise and instructed him to breathe life into them. And with these bones he breathed life into he forged an army which later became a nation known as the "House of Israel." The story of Ezekiel was revelatory. It grounded Sha. The biblical allusions in The Valley directly correlate to his own life as he captures the essence of his spiritual rebirth that propelled him to this current milestone. This project represents growth, adversity, rejection, failure, and pain. But, most importantly, it represents victory (even over Sallie Mae). I always thought valleys kinda sucked. You have this one set path that you HAVE to go through and because the walls are too steep to climb and you already know whats behind you, you have to keep moving forward. And for me, I'm known to have a serpent or two on my heels. The thing about valleys though is that in this place you can see the silver lining of the sky because there are no ceilings. and although your path may not have a lot of options you know you will make it out eventually. This concept is what shaped The Valley. This is the coming of age of a young kid from Broward County who has been breathing life into dead situations since birth. A young man resolved to shaping his own destiny with divine guidance and an unapologetic mantra. One who has traversed from the hood to the suburbs; from the folly of youth to a man who is still growing and learning. This project is for those who learned to swim.